I thought I’d share a little bit more about the process that goes into my ‘double wedding ring technique.’ LOL. Its not really a technique. Its just the zigzag stitch. 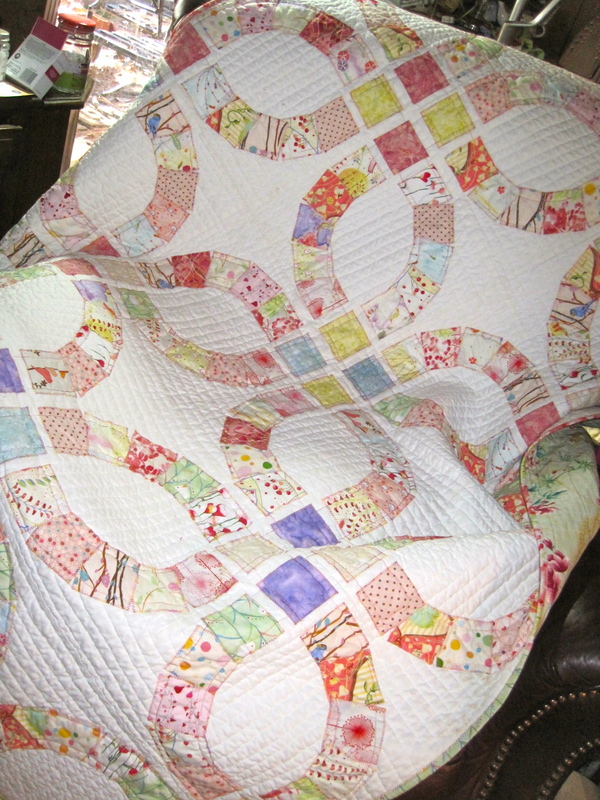 Here is the quilt that I pieced during my carpal tunnel surgery. It was fairly simple to position the squares on the background piece and place one pin to keep them in their place. And then I simply zig zag stitch around the edge of the piece, trying to catch one thread beyond the square so it will look neat, and so there will be minimum shredding of the fabric. I experiment and adjust the zigzag to the size I want. On my machine (a Janome 6500) that seems to be 3.0 and 1.2. You can see that I like to use a heavier thread and also a variegated thread sometimes. I think it just adds an interesting design element. Plus, it makes it a lot more interesting for me! I zigzag around each square, and just gently lift the corner of the overlapping square as I go by it. 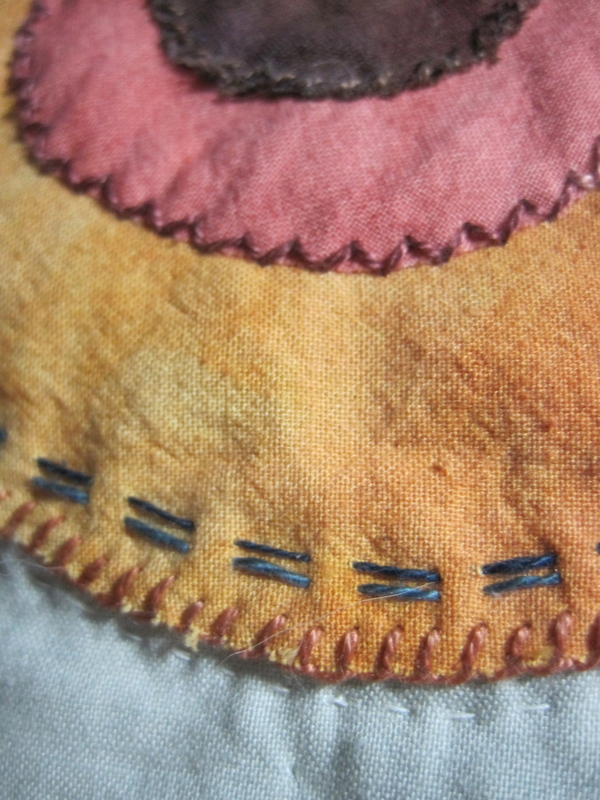 Sometimes I have to manipulate the stitches a bit to go around the corner, but I’m not going to attempt to describe that in words. And pretty soon, one block is completed. 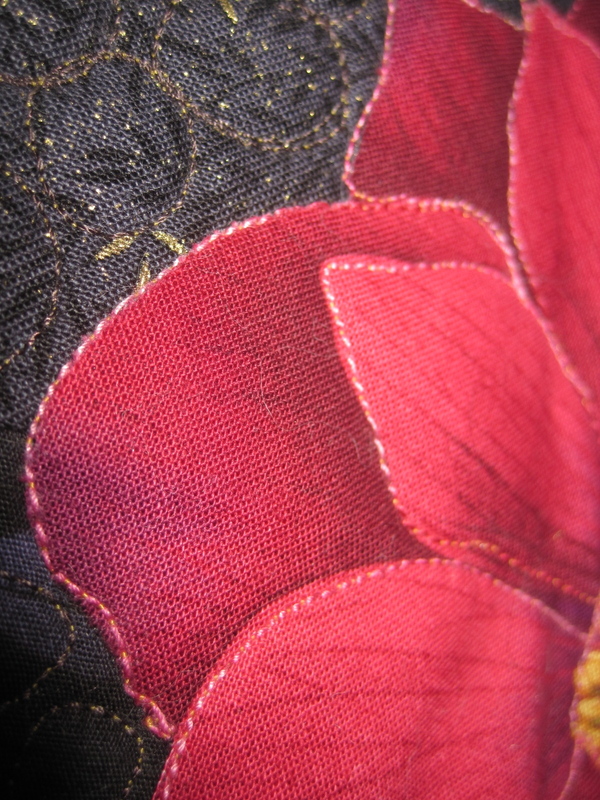 Here’s a close-up of how I just stitch carefully along the edge of the fused flower. 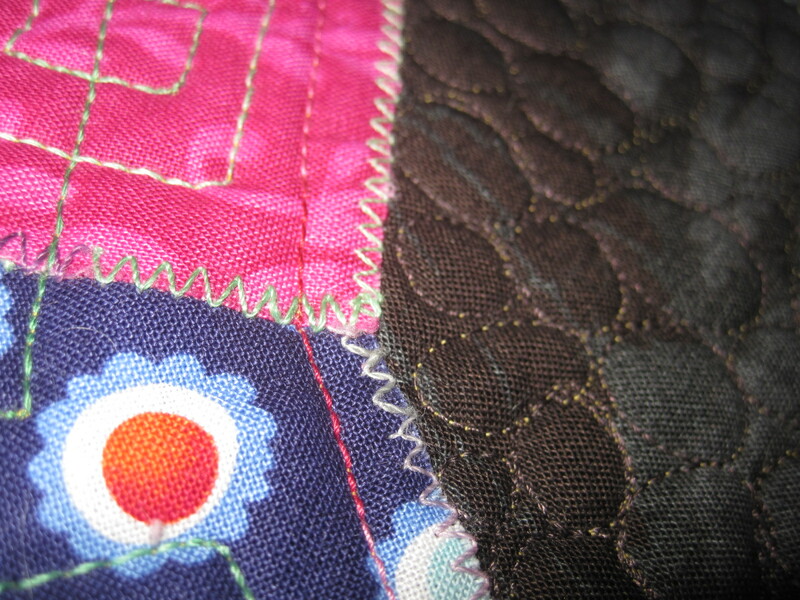 And a close-up of the quilting on the DWR. You can see I chose another variegated thread for this. 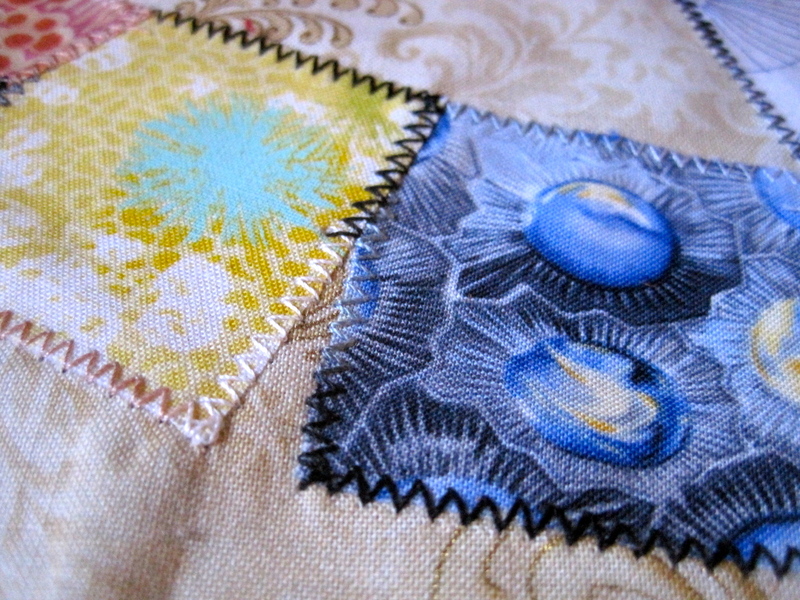 And one more close-up showing the bubbles that I quilted in the dark background. 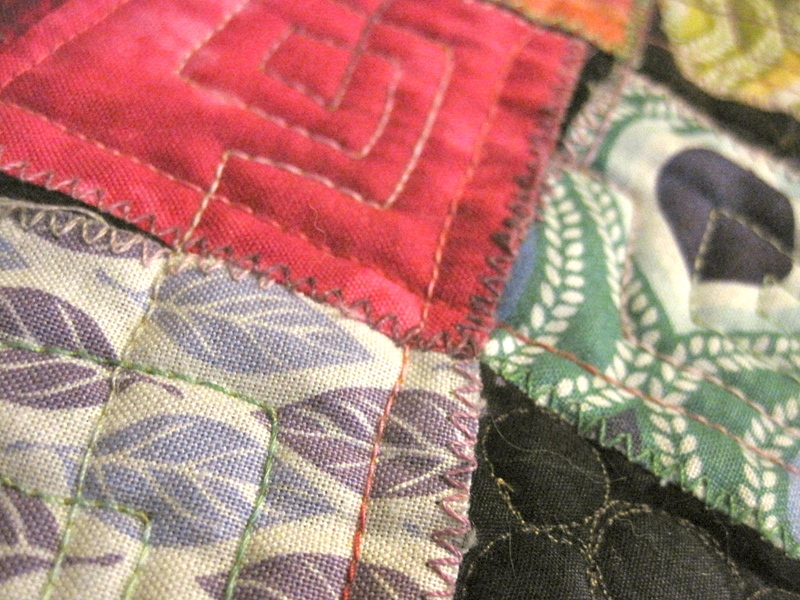 Gotta say, that was not fun, quilting with dark thread on a dark background. So that’s my adventures so far with the double wedding ring. 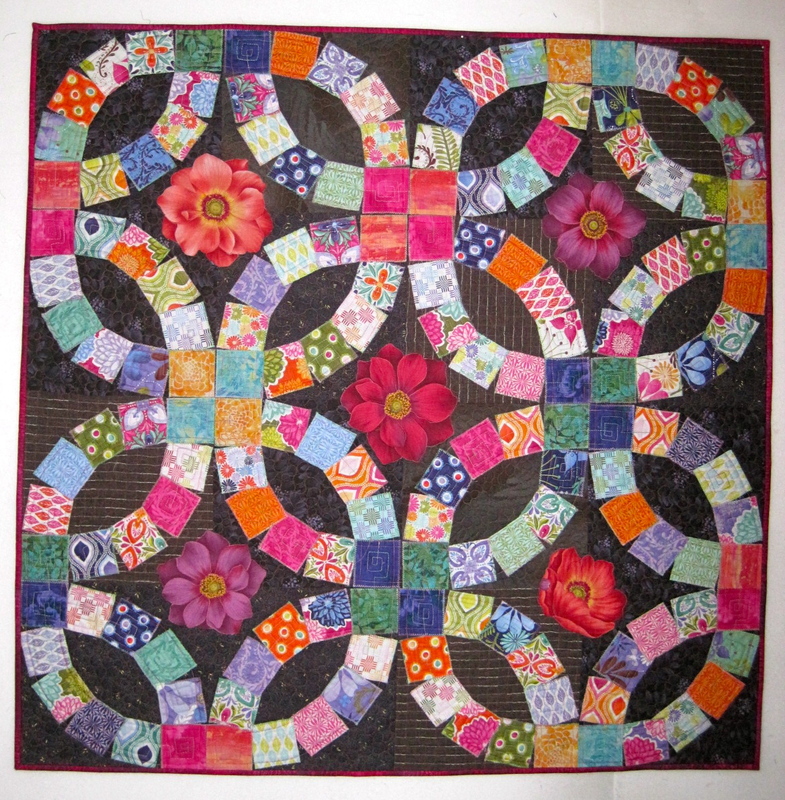 I have used raw edge zigzagging on some of my other art quilts, both in the piecing and directly in the quilting. And I like it very much. 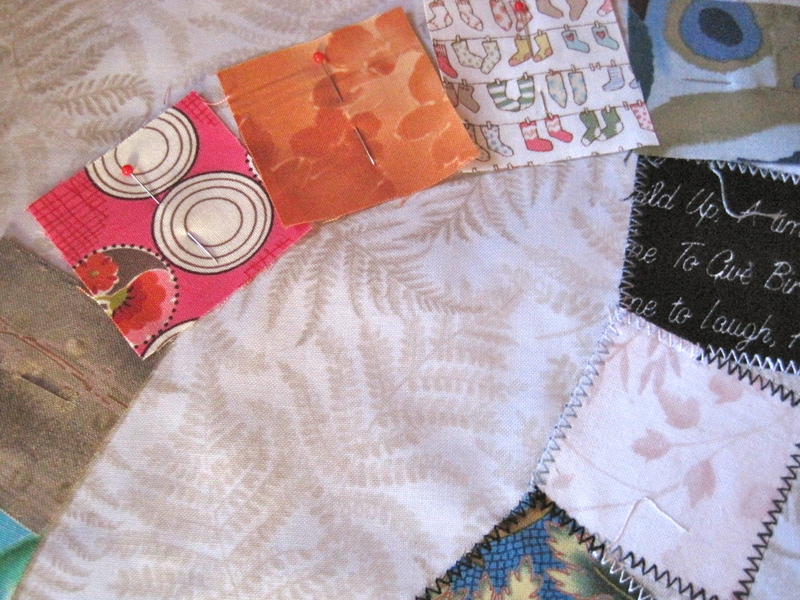 I always have to have a little quilt to work on when I travel. Its my version of a security blanket. Usually I don’t have that much time to work on the quilt. 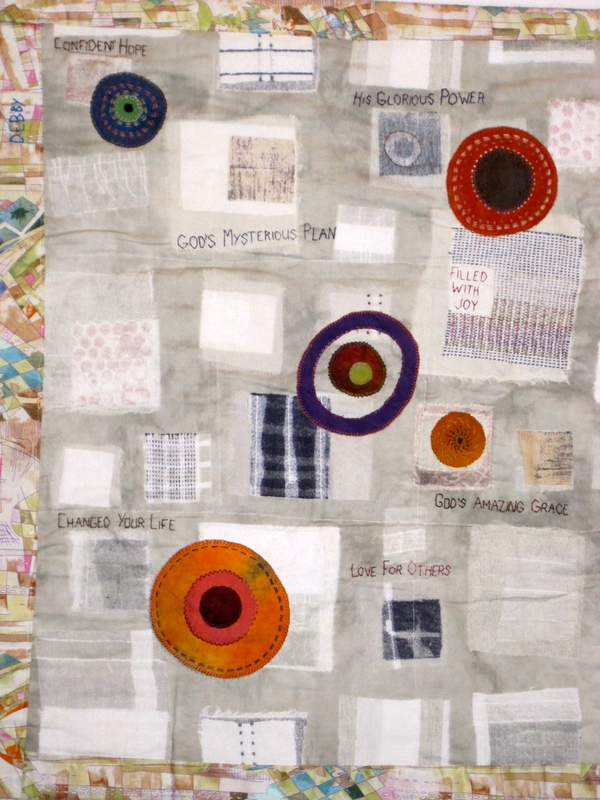 But I usually manage to take a few stitches, and I find that just by having the project with me I will sometimes find new inspiration or a new direction for the quilt. 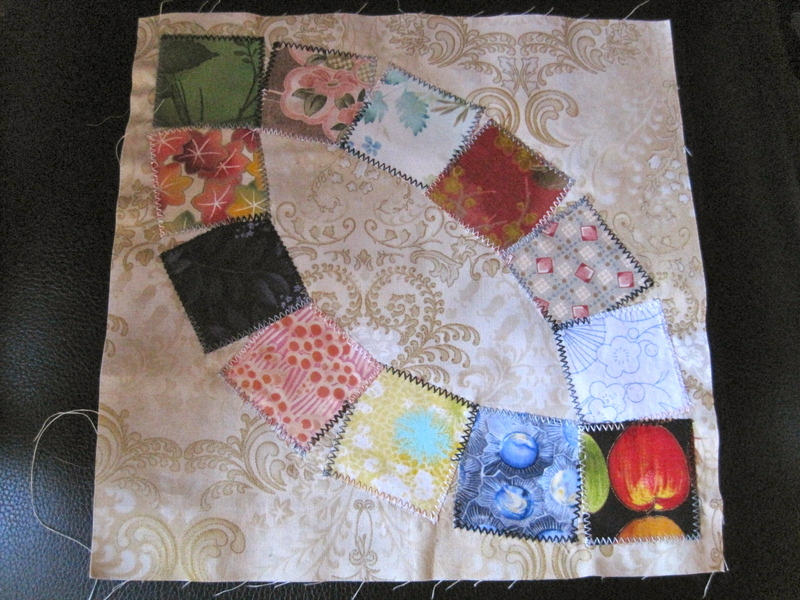 For this quilt I wanted to use this cool fabric for the background, and I knew I wanted to add some colored circles on top, and then to do a lot of hand stitching on them. Before this trip to Haiti I had been reading Colossians 1 every morning. Many of the words became very meaningful to me. I continued to read it while I was there. 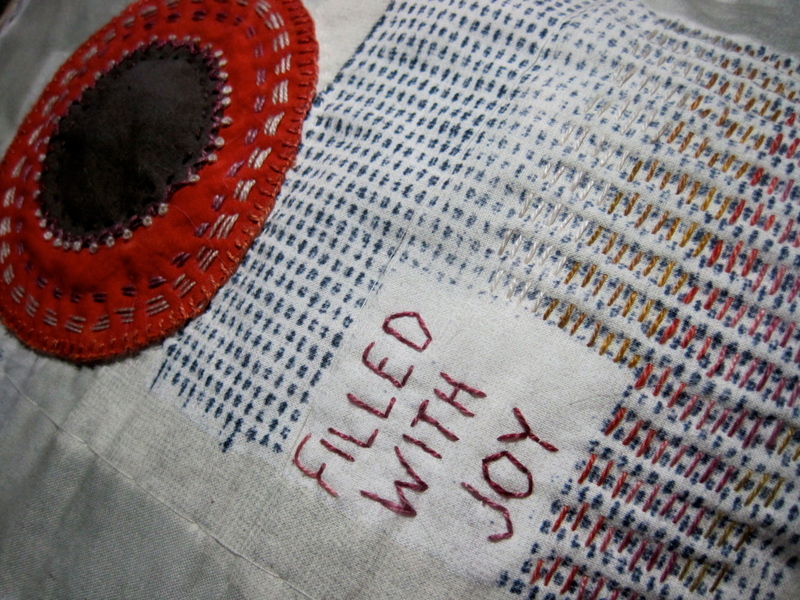 So that is how I got the idea to add some of the phrases to the quilt. 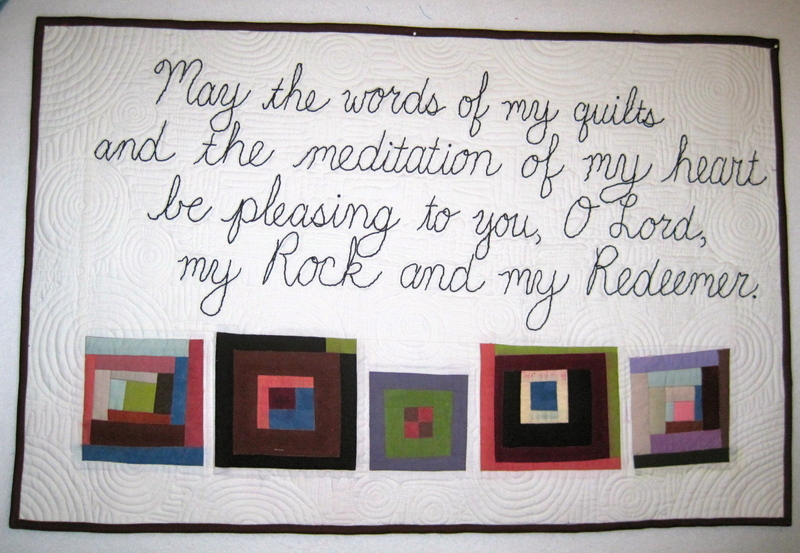 A little different than my other quilts, as they are not complete verses, but just phrases, and they are not even in a particular order. I like it. Also, as they say, necessity is the mother of invention. I don’t really like using fusible, and I found that I can very neatly hand-stitch the circles in place, using simple decorative stitches. Big score! 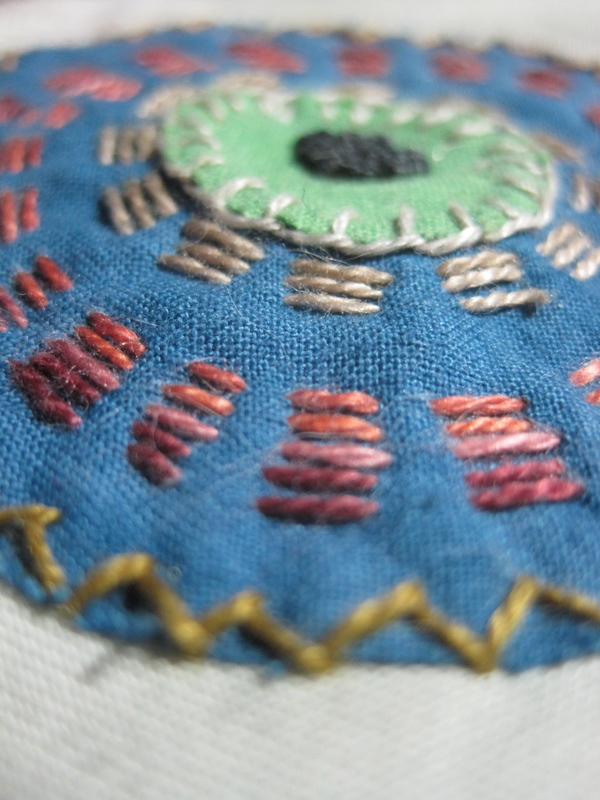 I think I will heavily hand-stitch the background on this one too, as you can see in this picture. And here is something I have done on my last few projects. 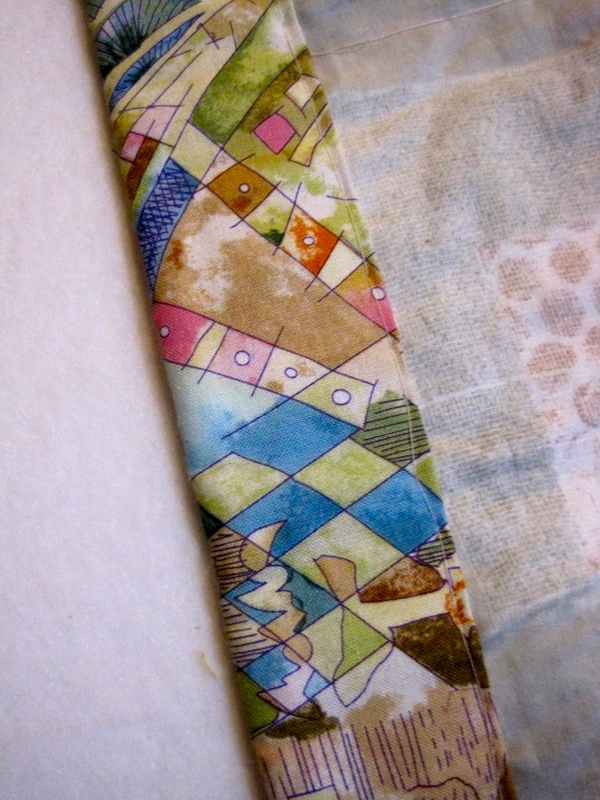 I always machine baste my small quilts, and by turning over the back and basting it in place, I have a very neat edge that keeps things nice and tidy. Most of the work you see was done after I got home, and sat in my big chair with two little dogs on my lap. I am thankful to be an American.